As many people know, I spent 30 years practicing internal medicine and geriatrics in the community in which I live. Like many community-based practices, my practice was not in an academic center and it was not on the hospital campus. So I did not have regular access to Grand Rounds, weekly teaching conferences, Morning Report, and all the other wonderful structures we have created to support each other in staying current in our rapidly changing field. What I did have, of course, was accountability to my patients to assure they were getting the best care available. And these patients were not strangers: they were neighbors, our kids’ teachers, my wife’s colleagues. This made every day–like the days of many of the members of the internal medicine community–a high-stakes day with consequential decisions to be made together in practice. Answering this question was a big part of why I signed up to take ABIM’s Knowledge Check-In (KCI) last Wednesday. In three hours, I would know if–in the judgment of objective, credible peers who weren’t trying to be nice to me–my knowledge was current. I am pleased to report that I passed, and I plan to continue precepting (which I think I would have stopped doing if I had not passed). But the experience itself was very enlightening. Even though it was “no consequence” for my ABIM credential (as it is for everyone taking it this year), it was consequential to me because it was going to tell me something important about myself. This made it stressful: I was quite apprehensive that I wouldn’t do as well as I hoped to do. I also didn’t want to fail, so I spent a lot of time over the last few months studying. This preparation helped me learn new things (I didn’t know that people past 65 are supposed to get BOTH versions of the pneumococcal vaccine! ), some of which came up in precepting. People ask me a lot how they should study for the KCI. Here’s my response: I imagine a colleague seeing patients Thursday morning, then taking a few hours out to take the KCI Thursday afternoon. So, which one is the “real test”? The KCI is a way to know if you knew what you needed to know to do what you did Thursday morning. If you don’t pass it, the real concern is the patients you saw that morning, not the exam. The KCI is a way to self-validate, to generate the assurance that you are “good to go” as a clinician. I certainly found that valuable. I was able to take it at home (and worried that my internet connection would fail, that the microphone and webcam I was using to connect with the PearsonVue greeter would fail, that something would interrupt me and, of course, the guy came to cut the grass while I was doing it, assuring a background roar throughout). It was a different experience than at the PearsonVue Center, took much less time out of my life, and the ability to use UpToDate® made the whole experience feel more like medical practice. This was the second time ABIM administered the KCI, and we are gathering feedback from the more than 1,200 diplomates who took it both online and in a test center. We know some of them experienced technical issues that prevented them from having the smooth experience I had, but we also know it was a much smaller percentage than those from the June administration. We are definitely learning as we go. I want to thank all physicians who submitted post-exam comments, and we’ll share their feedback in a subsequent post next week. 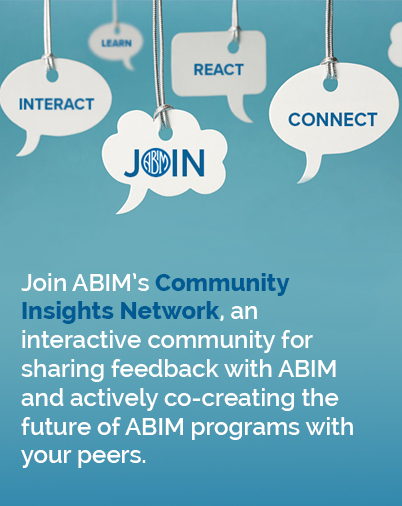 I believe ABIM has taken an important step on our journey to offer something that has less burden, more clinical relevance and may better accommodate the busy lives of internists and internal medicine subspecialists today. Thank you to all who took the KCI and have helped us continue to improve our programs.